There have been a lot of healthy learning curves in my time spent living with my in-laws. One that still continues to baffle me is the reading habits of my eleven-year-old sister-in-law. Partly because I am her ride to the library and partly because I read in virtually every genre and age group, she sometimes asks me for book recommendations. Some days I’ll try to help, others I’ll just shrug and say, “I have no idea.” I can never tell what’s appropriate for her or what will make her upset for one reason or another. What I believe I’ve learned is that you can’t truly know what is appropriate for someone else’s kid. I live in the same house as her, but I can’t gage from one book to the next how much she’s matured or what content she can handle. Therefore, I ask that you please take this into consideration with my recommendation on the book below. Personally, I love it when MG authors aren’t afraid to deal with hard topics. I especially love it when they do it in a way that is both wise and tender, so that younger readers can metabolize the depth of the themes they’re dealing with. From what I’ve read of her work, this is one of Kate DiCamillo’s talents, and her book The Tiger Rising is a perfect example of this. It is a short read, only 128 pages, which I actually think is one aspect of it that makes it easier to digest. 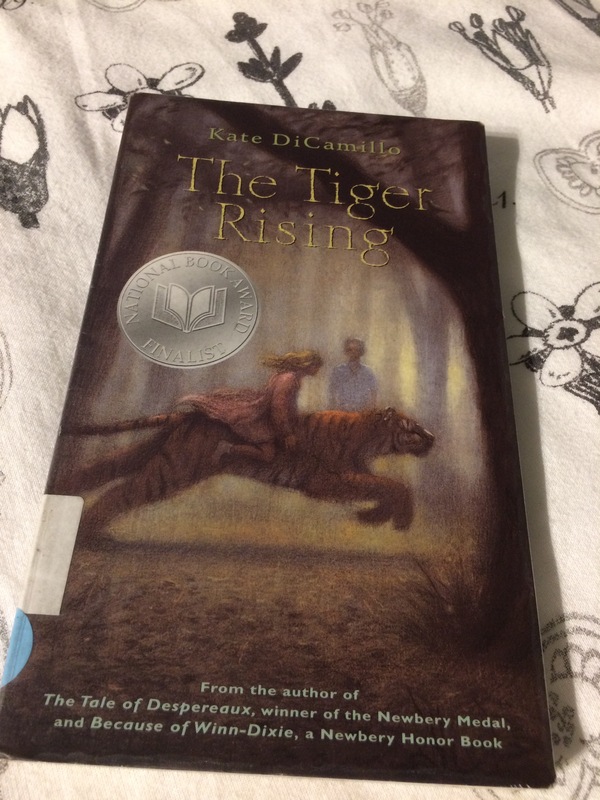 The story centers around a young boy and girl who discover a caged tiger. This becomes a metaphor for the struggles in both their lives, that of repressed anger and sadness. This book is about dealing with immense loss. Along with that, it also contains realistic portrayals of bullying and a heartbreakingly beautiful portrait of a family living in a motel, barely making their way. It is not a light bubbly read. It’s not intended to be. Yet I think it excellently done. I have seen some reviewers condemning it because it’s too sad or heavy. To me, what makes this a worthy read even for a younger audience is the tactful yet truthful way the hard issues are addressed. There should be space in children’s reading experience for books that show them how other people have to live. It helps them develop empathy for those around them. For example, say that a bully is made to read this book by a parent or a teacher, seeing the pain that the tormenters cause to the main characters might prick their conscience about their own behavior. Reading, if the writing is good, forces you into the headspace of another person as a necessary part of the experience. There are even studies that show reading good literature improves a persons ability to empathize. Also, let’s not forget that not all children lead charmed existences. Life’s ugliness does not pass over you because of age. If the child is experiencing a similar tragedy to the characters, it gives the child hope to read the story, not pain. They can say, “if someone I don’t know could write about a kid just like me, than I’m not alone.” That’s why truth in writing is so important. And, solong as it’s done on a level that they understand and can cope with, is it ever too early to preach truth to a child?